Why I am interested in these records. The records of the "Loyalist Claims for Losses" made by loyalists who suffered losses during the American Revolution are a major source of Loyalist information. John W Meyers provided evidence for his claim for his losses in October 1787. By then he had been discharged and given Half Pay as an officer and was residing at the "Bay of Kenty." Below is a transcription of John W Meyer's claim and the resulting payment of £247. Doug Knutson, of Windswept Productions, is making a video on Capt John W Meyers and has done considerable research. He shared the image below of one page of Meyer's claim that he obtained from the National Archives [formerly the Public Records Office] in London, England. Thanks Doug. In 1783 the British Gov't appointed Commissioners to hear evidence from Loyalists who had suffered losses of land and other possessions during the Revolution. They started hearing evidence in 1785. Commissioners reports of the evidence (AO 12) and bundles of evidence support documents (AO 13) have been filmed. See section 5 below for more about these records. This is a long web page so use these links to jump around the page. As recorded in Commission reports in AO 12. Account of losses sustained by Captain John W Meyers late of the Major Jessup’s Corps known by the name of the Loyal Rangers formerly of the County of Albany and Province of New York at present in Canada by his attachment to the British Majesty in year 1777. To 7 horses @£11.1s each 78. Evidence in the Claim of John W Meyers late of Albany County New York. Says he resided at St Johns and Isle aux Noix and Du Chene in 1783 on Service, resided chiefly at St Johns during the winter. Is a native of America, lived in Albany County when Rebellion broke out, joined the British Army in 1777. Joined Major Jessup’s Corps, staid with Burgoyne some time, but had leave to go after some Recruits, he got to New York. Afterwards came to Canada with dispatches, returned to New York and in the year 1780 returned again to Canada where he raised a Company and was assigned to Major Jessup’s Corps. Served till end of the War as Captain. Has half pay. Resides at bay of Quinty. Had 200 acres in Cohenning's Patent Albany County. Was to have had a lease for ever paying 10th part of produce. Had the Promise, but there were Infants concerned and he could not get the lease. Went upon it in 1771 – cleared 100 acres, built House and barn, planted orchard. Produces an application from one Bat Rossboon to the Commissioners requiring an appraisement of Claimants Farm as being forfeited amongst others offering to deposit 1/3 part of the value, in order it seems to purchase under an Act of the State. Values the Improvements at £400 York money. Lost 7 horses, 4 cows, 5 young cattle, 30 Hogs, 17 sheep, utensils, Furniture, 140 bushels wheat. These things were taken after he joined Burgoyne, most of them in 1777 and 1778. Served with claimant as a servant, he joined Burgoyne, he went afterwards to New York, he from the first to the last did all he could for the British Government. He carried dispatches to Canada. He served at New York under Colonel Richmone several months which was draughted into other Regiments. He afterwards raised a Company in Canada. Knew his farm, 100 acres Clear, he was on it 6 years before the War. Knew his stock when he went from home, they left 7 horses and a good stock behind them, 4 cows, 5 young cattle. The Rebels got most of the things. Source: Claims, American Loyalists, Evidence, 1787-88, New York, LAC films of National Archives holdings in England, AO 12, Vol 29, 23-25, film B-1162, Archives of Ontario, diffusion D 12, for index see film C-9821. The decision is recorded in two volumes - 64 and 109. Note *: Peter Johnson, Loyalist expert, states "The proper name of the regiment was the Loyal Rangers. I usually refer to them as (Jessup's) Loyal Rangers to cover all bases." Thanks to Doug Knutson for this image. Source: Claims, American Loyalists, Series 11, New Claims, New York, LAC films of National Archives holdings in England, AO 13, Vol 14, film B-2187, Archives of Ontario, diffusion D 12, for index see film C-9821. The records for the Loyalist Claims for Losses are a vast and somewhat confusing collection. The original bundles of evidence documents and Commission reports were stored in London's Audit Office. Those that remained in Britain are now housed in the National Archives in London, England and designated AO. In 1874 a major set of 34 original volumes of "rough minutes of the hearings of the various claimants before the Commissioners" were given to the Smithsonian and are now housed at the Library of Congress. Most of the information in these volumes is repeated in volumes in AO 12 and 13, however some rejected claims are unique to these 34 volumes. In 1904 a transcription of the 34 volumes mentioned above was published; titled the The Second Report of The Bureau of Archives For the Province of Ontario, Subtitle: United Empire Loyalists, Enquiry into the Losses and Services in Consequence of Their Loyalty, Evidence in the Canadian Claims, 1904, Alexander Fraser. It is online at Internet Archive. Click on these links for Part 1 (pages 1 to 704) and Part 2 (pages 705 to 1436, including the index.) If these links don't work then try this page and click on Volume 2, parts 1 and part 2 (two separate volumes). Thanks to Mark Davenport for bringing these links to my attention. The Library and Archives of Canada (LAC) microfilmed all these holdings and more - AO 03, 12, 13 and T50 and these films are designated MG14 and MG15 at the LAC. The Archives of Ontario has a set of films done by the LAC as Diffusion material designated D 12. They also have films of the original reports held at the Library of Congress under Diffusion D 357. Film C-9821 has the index for AO 12 and 13. See the Loyalists' Claims for Losses finding aid (page 2). The Church of Latter Day Saints library also has the microfilms. Search "American Loyalist Claims" to see their holdings. Lastly, see the book American Migrations 1765-1799 by Peter Wilson Coldham, 2000, Genealogical Pub. Co.
All 5,800 individual claims - the entire contents of the papers of the Claims Commission that form record classes AO 12 and AO 13 at the Public Record Office - are abstracted in this new and comprehensive publication. The full erroneous quote from Cruickshank: "When the militia of the [Hastings] county was organized about 1798, [Capt John W Meyers] was, as a matter of course, appointed captain of the local company and seems to have held that command until the beginning of the war in 1812 as his name appears in an official list of officers and soldiers in service. He was then succeeded by his son, George." Ernest Cruickshank is a respected early historian of Upper Canada history and Doug Knutson noted the quote below that John W Meyers was a "Captain of the local company." The J. W. Meyers in the early Militia records are of his son Jacob W Meyers. Half Pay officers such as John W Meyers, were exempt from Militia duty by the Militia Act of 1793 though some did continue to be active in the militia. No record has yet been found to support the claim that John W Meyers was active in the Hastings Militia. In 1783, after the American Revolution both British Army and Colonial Militia officers were given half-pay. The lists of these officers are kept in the National Archives, Kew. John W Meyers was likely put on Half Pay around 1784. 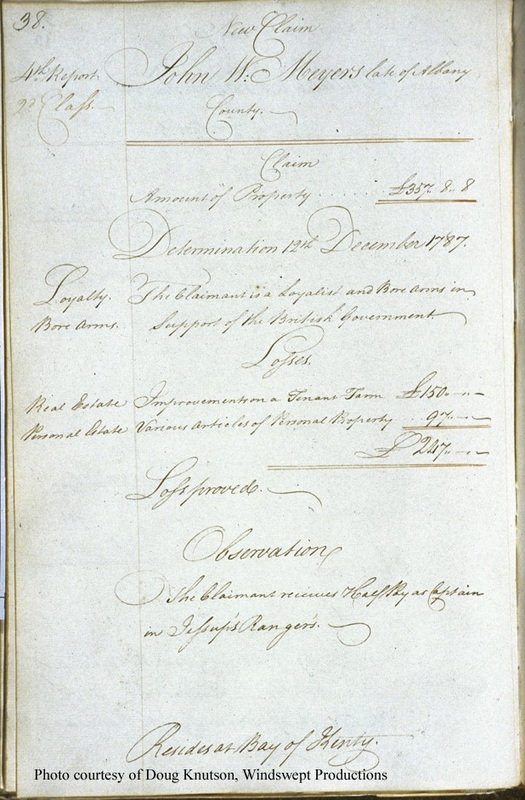 See British/American Half Pay c1782, reference War Office Records WO 65/165 and WO 65/166 at the National Archives, London, England. They are microfilmed. More is said about these Half Pay records on the web site of the Loyalist Collection at the Univ. of New Brunswick.